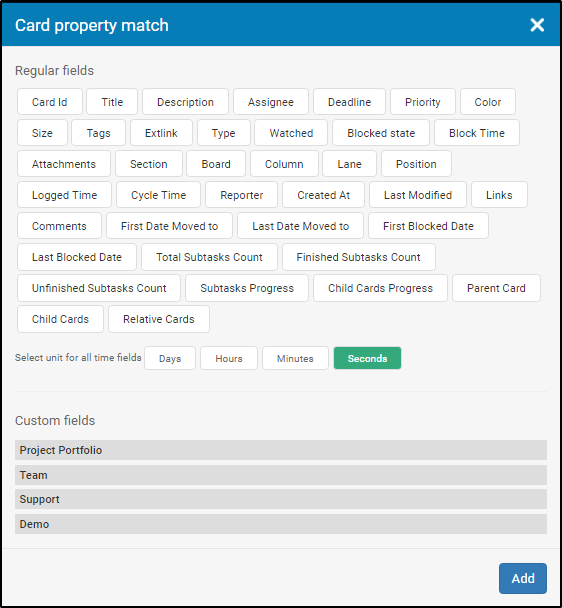 This business rule will automatically move a parent card to a specified position, when all of its children cards are moved to a predefined set of columns/swimlanes. A typical example would be to move a parent card to "Done" when all of its children are moved to "Done". This rule is very useful for tracking bigger projects and is suitable for the Portfolio Kanban management scenario. Go to your Administration panel at the top right of your screen ->open the Business Rule Tab -> select the "All children are moved" rule. In the Name and Description fields, you can define the name of the rule and give a description of the scenario you will achieve with it. This way you can create an overview of your active business rules, as upon creation every automation is present in the Business Rules panel. 1. WHEN - this is the event which will trigger an action when it occurs (i.e. all children cards are moved). Position: the filter position is mandatory for this Business rule. There are two options: position is/is not - select one of the options from the dropdown. Click on Not Set to select a board from the dropdown and a position from the board minimap (you can select a cell or an entire column/swimlane by clicking on its name). For all time-related fields, you can select the following units: Days, Hours, Minutes, Seconds. When you have added the filter, set it up by clicking on Not set or enter a value. 3. THEN - Define the position where the parent card is to be moved. Click on Add Action -> click on Choose where to move -> select the board and position from the board minimap (you can select a cell or an entire column/swimlane by clicking on its name). Read more about parent/child links and how to create them.